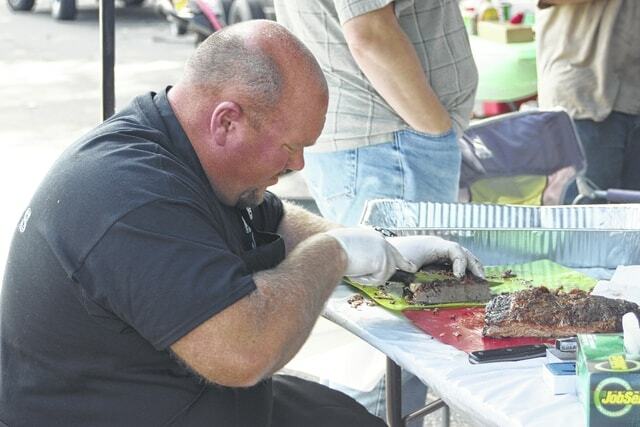 Jack McGee cuts a piece of beef brisket during last year’s inaugural Gallia County BBQ Festival. GALLIPOLIS —This year’s version of the Gallia County BBQ Festival should be even better than the last. Hosted by the Gallia County Convention and Visitors Bureau, the festival is free and will take place Sept. 12 in Gallipolis City Park and First Avenue/State Street. There will be plenty of activities set up around the park from noon to 3 p.m., and people will be able to buy barbecue sandwiches, as well as refreshments. No coolers will be allowed at the festival that day, except for teams taking part in the BBQ Competition. In the BBQ Competition, up to 15 teams will vie for the “Michael Cockerham Grand Champion” trophy for best combined score in the Pork and Brisket category. The meat will be provided by “Rowdy’s Smokehouse” in Jackson. The winner will receive $500 cash and a trophy. There will also be a volunteer category for “Rowdy’s Smokehouse Best Ribs” with a cash prize of $250 sponsored by “Rowdy’s Smokehouse.” Teams in this category provide their own meat. The festival will also present the “Kenny ‘Smooth’ Siders II Peoples’ Choice” trophy from entry votes by attendees. Meat will be distributed at 5 p.m. Sept. 11, followed by a mandatory cooks’ meeting at 5:30 p.m. All meat must be prepared and cooked on site. Teams may arrive after 3 p.m. Friday. Turn-in times are noon for pork; 12:30 p.m, for brisket; and 1 p.m. for ribs. There will be six judges who will determine the overall winner. That winner will receive $500 cash and a trophy A separate set of six judges will determine the “Best Ribs” winner. After contestants have turned in their samples for judging, they will donate the pork to the GCCVB, who will set up a tent and begin selling sandwiches, drinks and snacks to the public. People who buy a sandwich from GCCVB will receive a ticket to vote for the “People’s Choice” winner. The GCCVB has invited area organizations to set up in City Park during the BBQ Festival as part of a “Get to Know Your Community” event. These organizations can sell items (except food) for fundraisers, give away prizes, membership drives and informational awareness. There is no charge to participate. Spots will be first come, first serve. From noon to 3 p.m., the Gallipolis Car Club will have a “Cruise-In” on the State Street side of City Park and there will be live music on stage by “The Blue Z Band” and “Swampfoot.” Free activities for the kids from 12:30-2:30 p.m. include face painting by Jody Rife, balloon sculpting by Cowboy Mark Wood, and train rides. Teams can stop by the Gallia County Visitors Bureau, 441 Second Ave., Gallipolis; call 740-446-6882 or email info@visitgallia.com for an entry form and rules.